According to a banker, the recent rise in preferential issues is also because banks and financial institutions are resorting to the use of this instrument increasingly. Indian companies have shown a penchant for raising funds via preferential issue of shares. In the last five fiscal years (FY12-FY16), funds raised through preferential issues were as high as 43% of total funds raised. As the name suggests, in a preferential issue, shares are allotted to a select group of investors. Generally, shares are allotted to the promoter group, who opts for this route when market sentiment is weak. This helps it increase its stake in the company at relatively cheaper valuations. To be sure, the environment for equity fund-raising has not been too good in recent years, and this could be one reason why companies have relied on a greater share of funding from the promoter group. 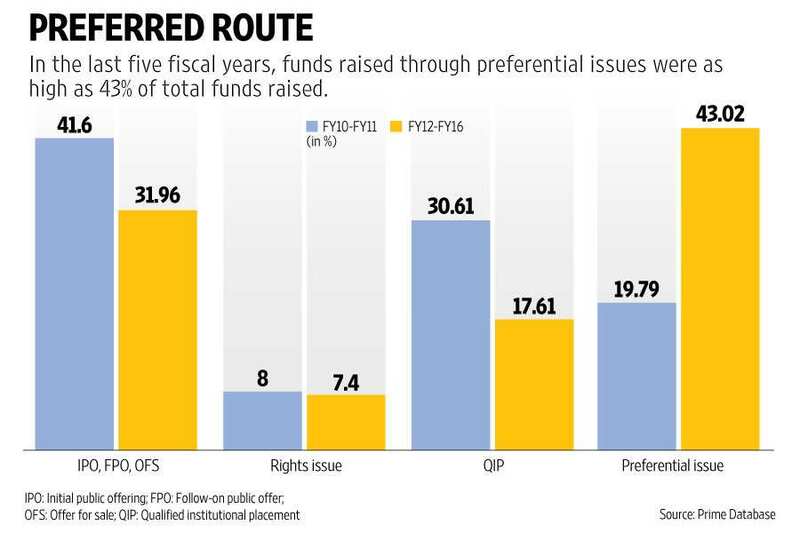 In contrast, in FY10 and FY11, when the primary market had bounced back, preferential issues accounted for only 20% of all equity funds raised. During the same period, qualified institutional placements accounted for a higher share of 30.61%. According to a banker, the recent rise in preferential issues is also because banks and financial institutions are resorting to the use of this instrument increasingly. This helps them shore up capital and grow their loan book. Data from Prime Database shows that 116 NSE-listed companies used this route to raise funds in FY16. These included 18 banks and three financial institutions. Bank of India raised money thrice in FY16, while State Bank of India, Canara Bank, Allahabad Bank and IDBI Bank Ltd raised funds twice via a preferential issue.